The Lonely Death of Lizal Anders. I’m a big fan of storytelling in video games. The scripted stories in big RPGs can vary dramatically between the purely functional setups of things like Diablo to the heartbreaking sagas of Final Fantasy VII or X. The silly procedural stories that drop out of the bottom of Dwarf Fortress are, for me, one of the main draws of the game. 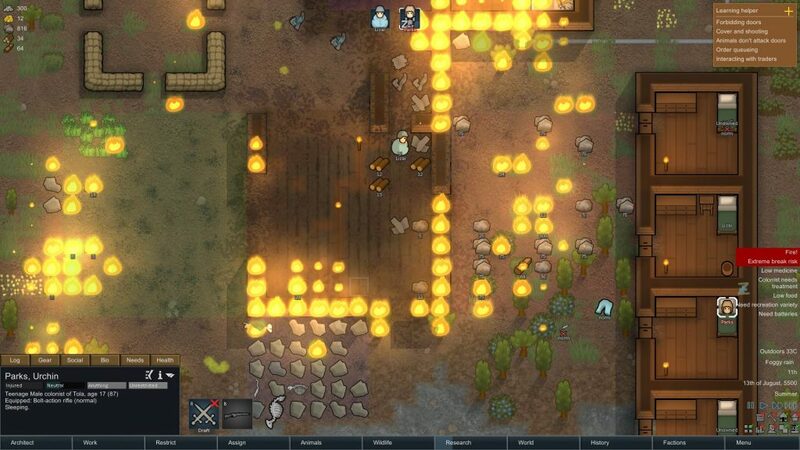 Rimworld is like nothing I’ve ever played before. Procedural storytelling is at the very core of the game – in fact, you can choose and customise the kinds of storyteller that will drive the game logic, determining how often your little colony will be attacked, how stable and healthy your colonists are, and so on. I’d heard good things about it. Well. I had a short-lived colony on Friday night and the story that came out of it, that I’m about to relay to you, has haunted me ever since. We started out with an optimistic little group of 3; Lizal – slightly insecure, gentle, a good worker; Dorothy – confident, capable with weaponry; Parks – young, slightly lazy, a little bit nervous. All was going well – we’d put together a decent little starter base with a rec-room / dining room, a large refrigerated room, a good sized farm plot with a crop of rice underway, and a nice little suite of bedrooms. As the worked together on the farm, Lizal and Dorothy grew very close. Parks began to excel at hunting – often bringing back way more animals than were needed or could be used. That should have been a warning sign right there. At the beginning of summer, there was a heatwave. As the colony was entirely supported by wind-power, everything stopped working and the stored food – no longer refrigerated – began to spoil. We needed to build a solar array as soon as possible, and in order to manufacture this we needed more steel. As the most able miner, Dorothy set off to a nearby rock outcrop and began mining. Like the Dwarves of Moria, alas, Dorothy delved too deeply and awakened something nasty. By the time Lizal and Parks arrived to rescue her, she was at death’s door. With no one else able to mine the ores required to make steel, we had no choice but to nurse Dorothy back to health as quickly as possible, while living on iron rations and suffering the sweltering inescapable heat. But then the food ran out. Starvation set in with Lizal and Parks but it claimed Dorothy first. Then the unbearable heat and hunger did something to Parks and it manifested as a tendency towards pyromania. He began lighting small fires around the base. The drained batteries exploded and the base began to burn. Parks watched this for a moment and then went to his bed. Returning from Dorothy’s grave, Lizal found the entire camp in flames and immediately started rushing around trying to put the flames out. She ran, badly burned, to wake up Parks but he ignored her. She rushed back outside just in time to see the thing that had been awakened in the mine take Dorothy’s body from the grave and head off with it. This proved too much for poor Lizal and she slowly walked into a corner of her field. [I looked at her needs panel – -100 I just want it all to be over] and sat down and waited for the flames. And that’s how it all ended. And I don’t know if I can start a new game.